This formula provides you with the essential ingredients to achieve your true strength including 175 mg of caffeine from natural sources to help increase alertness and focus in the gym. Gold Standard Pre-Workout is made with premium ingredients including creatine for power & increased physical performance in successive bursts of short term, high intensity activity and vitamins B1, B3, B5, B6 and B12 which all contribute to normal energy yielding. Optimum Nutrition also includes foundational ingredients; CarnoSyn® Beta-Alanine, Citrulline, L-Carnitine & N-Acetyl-Tyrosine which are combined to make this a Gold Standard perfectly engineered formula. This formula has also raised the bar on flavour, setting the Gold Standard for both performance and taste. Mix 1 scoop (11g) in 350ml of cold water. Recommended daily consumption of one serving per day. Creatine Monohydrate, Amino Acids, (L-Citrulline, Beta-Alanine as Carnosyn®, N-Acetyl L-Tyrosine), Acidity Regulators (Citric Acid, Malic Acid, Tartaric Acid), Flavourings, L-Carnitine, Vitamins (Pyridoxine Hydrochloride, Nicotinamide, Calcium D-Pantothenate, Cyanocobalamin, Thiamin Hydrochloride, Cholecalciferol, Pteroylmonoglutamic Acid), Grapefruit Bioflavanoid Complex, Natural Caffeine, Colour (Lutein), Thickeners (Cellulose Gum, Xanthan Gum, Carrageenan), Anti-Caking Agents, Silicon Dioxide, Calcium Silicate), Sweeteners (Sucralose, Acesulfame L), Panax notoginseng Root Extract Powder, Spirulina Powder. Consult your physician before using this product if you are taking any medications or are under a physician’s care for a medical condition. Gold Standard Pre Workout is only intended to be consumed for healthy adults 18 years of age and older. Not recommended for pregnant or breastfeeding women, or those that are sensitive to beta-alanine or caffeine. Do not consume caffeine from other sources while taking this product. Beta-alanine may cause a harmless, temporary tingling or flushing sensation. Do not consume with alcohol. To be used in a framework of a healthy diet and lifestyle. Food supplements are not to be used as a substitute for a varied diet. Do not exceed the recommended daily does. Keep out of reach of children. 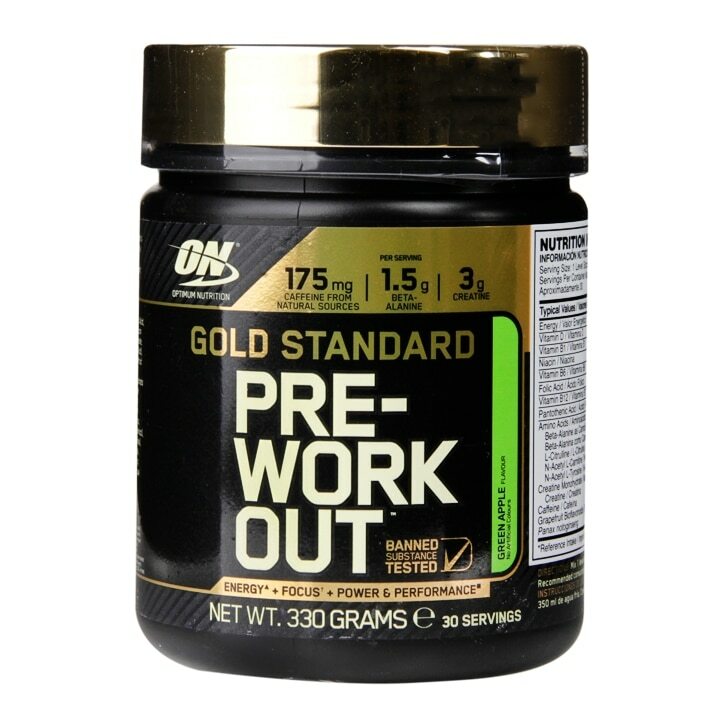 Optimum Nutrition Gold Standard Pre-Workout Powder Green Apple is rated 4.0 out of 5 by 14. Rated 3 out of 5 by Alex100 from The taste becomes awful after using it a few times I bought this product a few months ago because i was always tired and lacked motivation to workout especially early in the mornings. So when i got this product i was so excited to use it but after using it a few times the taste got really bad. The taste wasn’t pleasant anymore. So i started using it less and less often because of the taste. However i discovered that if you mix it with juice for example the taste isn’t as strong so i could successfully drink it all. The product itself actually does work it made me more energised and more willing to workout. So overall the product is great but the taste is horrible unless mixing with juice or maybe getting another flavour.